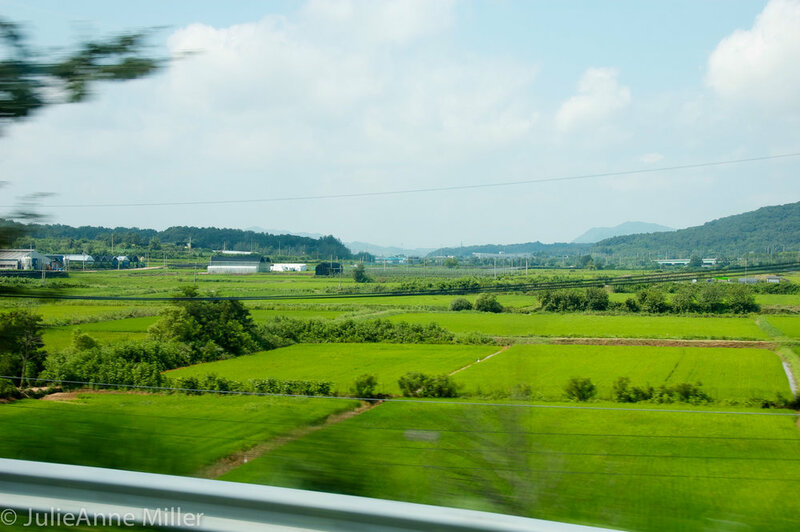 1 day itinerary for tour of the Demilitarized Zone (DMZ) of South Korea. North and South Korea are, technically, still at war. In 1953, in tents erected in the small village of Panmunjeom, the two nations signed the Korean Armistice truce agreement and established a four-mile wide de-militarization zone (DMZ) along the 38th parallel. While this ended overt fighting, it did not end the war. 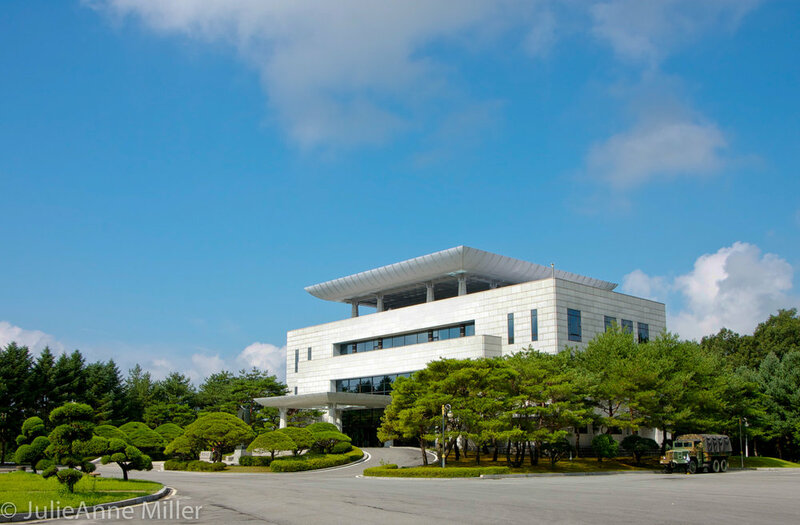 Over time, tents were replaced by permanent buildings at Panmunjeom, formalizing the Joint Security Area (JSA). 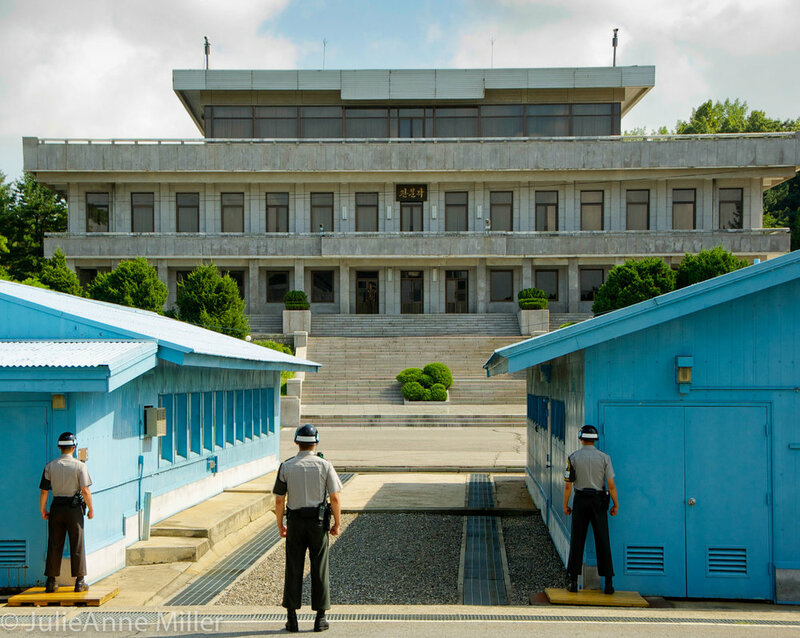 On either side of the Demarcation Line (DML), which runs through the middle of negotiation buildings at the site, ROK and DPRK soldiers maintain an intense stare-down that has endured for decades. To appreciate Korea's recent history and internalize the tense relationship with North Korea, a trip to the DMZ and Panmunjeom is essential. Note: Touring the DMZ, Camp Bonifas, and Panmunjeom must be arranged in advanced through an organized tour agency. Plan at least a week in advance - more if you are South Korean. You will need to provide copies of your passport and adhere to strict clothing and camera guidelines during the tour. 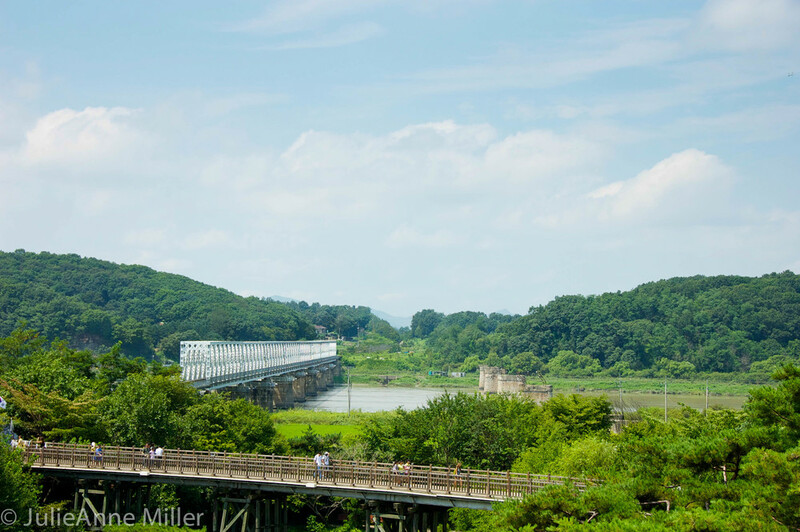 Most tours leaving from Seoul will cost around $100, which typically includes bus transportation, guided tours of sites at the DMZ and JSA by soldiers of the United Nations Security Forces, transportation to Imjingak in Paju city, and lunch. Tours typically leave at 8:00 am and return by 4:00 pm. The road to the DMZ is surreal. Seoul's modern high-rise apartments shrink in the distance, replaced by oxen-plowed green fields. 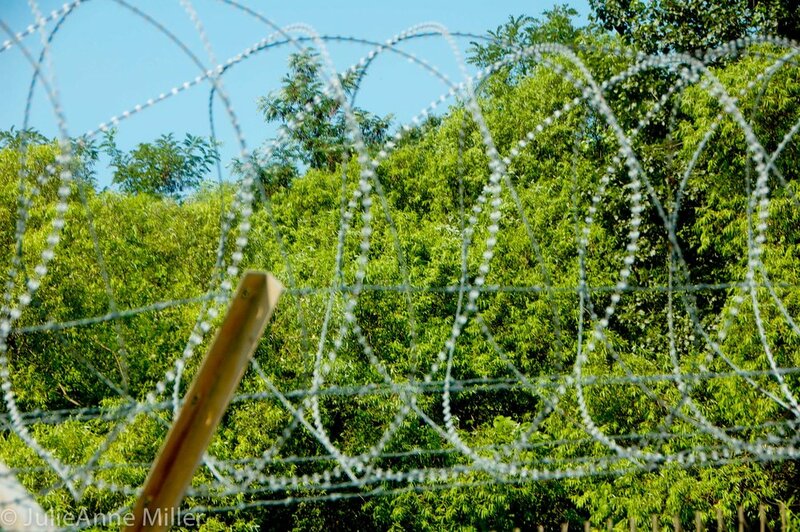 Barbed wire fences separate the highway from the muddy brown river. Patrol posts dot the landscape and traffic becomes sparse along Tongil Road (통일로). In just 90 (short!) minutes from the nation's capital, the bus drives past Dae Seong Freedom Village (대성동 자유의 마을) and through the entry gate at Camp Bonifas. Camp Bonifas houses the United Nations Command Security Battalion, a group of soldiers "In Front of Them All" who operate on high alert, constantly ready to deter war. These guys are disciplined, tough, and ready to answer curious tourist questions. The tour begins at Freedom House with a safety briefing and slideshow that provides historical background. Through this presentation, tourists gain an immediate appreciation for the high price of "peace". Numerous violent incidents since 1953 have resulted in the death of over 50 Americans, 500 South Koreans, and hundreds of North Koreans. It is a solid reminder that you have entered an effective war zone - an unsettling feeling for those of us privileged to live in safety and comfort. Other points of interest outside of Freedom House include the Sunken Garden, built in commemoration of the Soviet defector incident, and Freedom Pagoda. 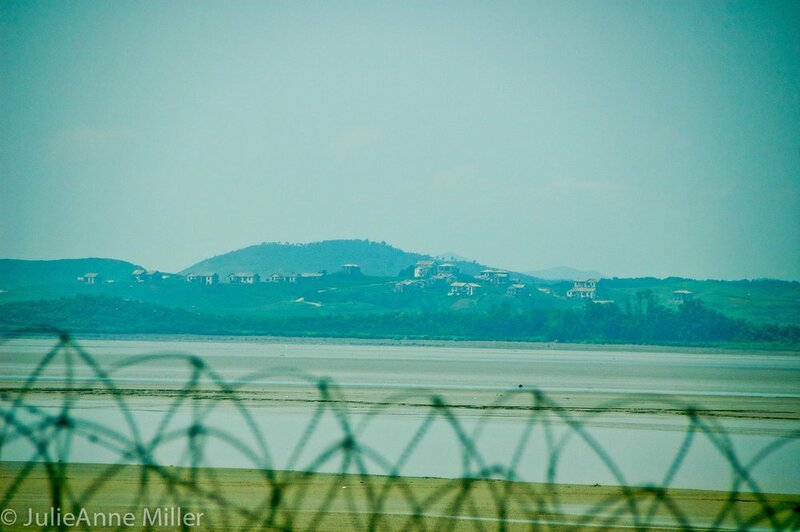 Behind Freedom House is the Joint Security Area and Conference Row. A raised concrete line can be seen running between the three major buildings on Conference Row; this is the Demarcation Line (DML) separating Panmunjeom in the South from Panmungak in the North. Except on the rarest of occasions, visitors, negotiators, soldiers, and politicians are not allowed to cross the line. During my visit, we entered the Military Armistice Commission (MAC) building, an austere, no-nonsense room in which meetings essential to the upkeep of the Armistice Agreement take place. These meetings range from tense confrontations regarding perceived armistice violations to administrative meetings. There are strict rules of protocol in these buildings and one does not get the sense that these walls have heard much laughter in half a century. 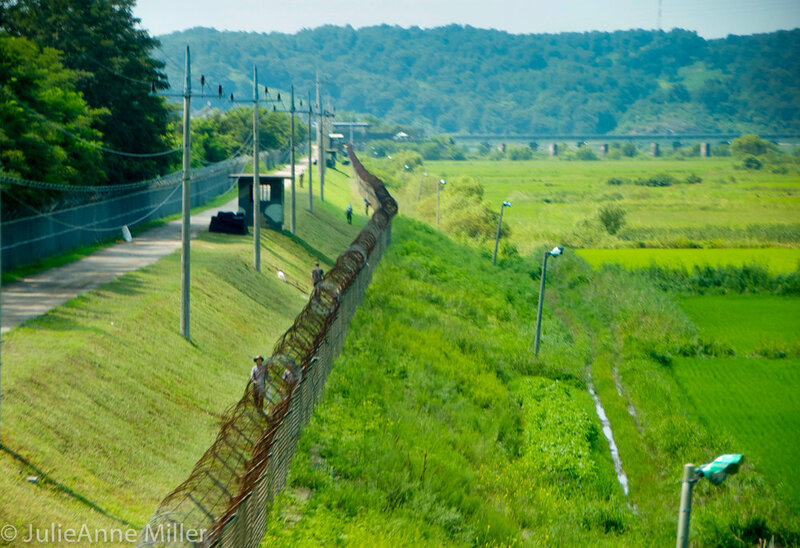 To see views of the DMZ from the North's perspective, click here! 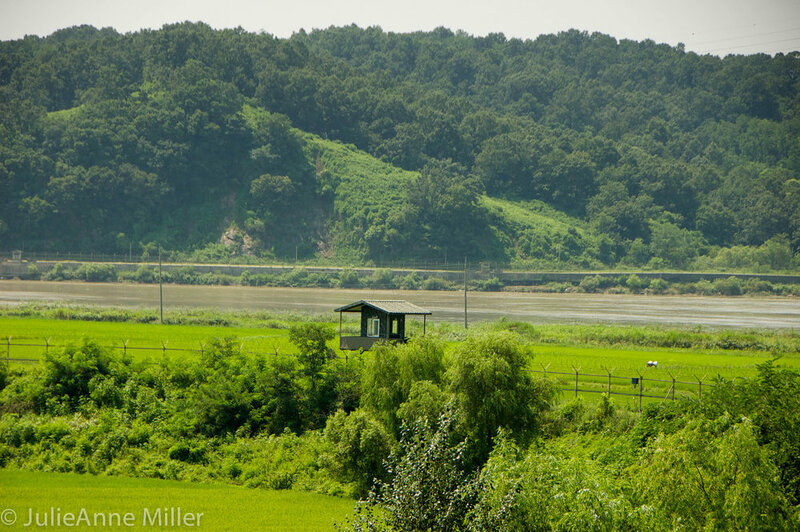 The banks of the Imjin River and the city of Paju form the borderland closest to the DMZ. Imjingak is a park dedicated to maintaining the hope of reunification. There are many monuments, expressive poems carved into rocks, and a memorial alter called Mangbaedan, where people of North Korean descent can perform ancestral rights during important holidays. It is here that you start to internalize the division. On the opposite side of the river lies a homeland and families to which some can never return. There are bridges that no one is allowed to cross; a river carefully guarded by armed soldiers; a railroad that ends; a country divided by a political line. 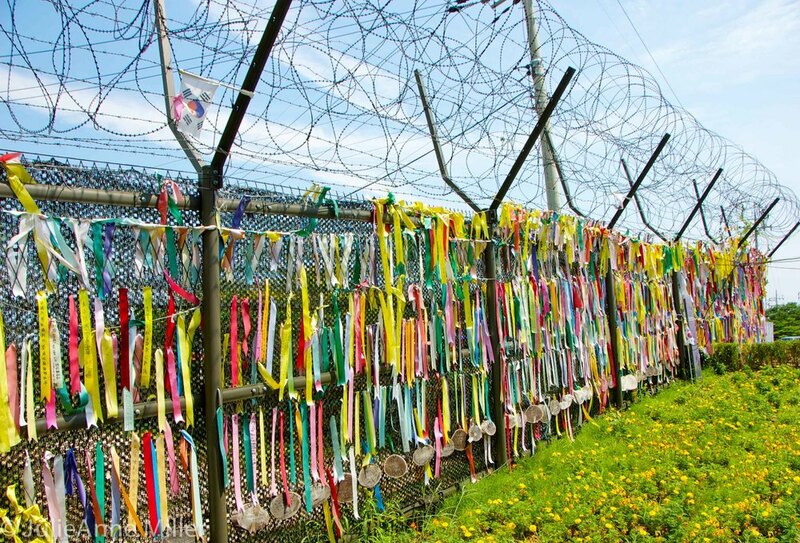 Along barbed wire fences are ribbons, placards, name cards, flags, photos, and notes -- tangible expressions of longing and hope for peace, unity, and national pride. Woljeong-ri Station (월정리역) marks the last train stop at the border. A train relic placed upon the site of one of the fiercest battles reminds us of the damage, cost, and sorrow of war. A sign near the train that used to ferry passengers to and from Pyongyang says "The Iron Horse Wants to Run". Soldiers patrol the perimeter here as diligently as they do elsewhere. An informative display explains how they use stones placed in the fences to detect signs of intrusion and to keep track of patrol rounds. Tourists are free to wander around Imjingak. An observatory atop the museum provides a panoramic view of the park and North Korean land on the opposite side of the river. There are frequent events hosted at the park, such as running races, military band performances, and other entertainment. We happened to visit the day hundreds of people marching for unification reached their destination. The atmosphere was festive, with lively music. For such a sorrowful place of contemplation, the positive vibe was welcome. We left feeling hopeful. Note: We visited the DMZ and Imjingak following a period of very heavy rain. We were not allowed to visit the Bridge of No Return or the Third Infiltration Tunnel because the area was flooded. That was a bummer!